Finally, Secretary Pritzker praised the Manufacturing Extension Partnership, and centers like the Michigan Manufacturing Technology Center, where experts and consultants provide practical advice to local manufacturers, while assisting them in transforming business plans, accessing new technology, and increasing exports. Innovation in manufacturing is only as strong as the talent base behind it – that is why the Department of Commerce has made skills development a top priority. Explaining that 21st century manufacturing jobs are different from manufacturing jobs of only a decade ago, Secretary Pritzker called on companies like Whirlpool to participate in efforts such as Manufacturing Day, an annual event to be held this year on October 3, 2014. Last year’s Manufacturing Day encouraged 834 organizations – mostly manufacturing companies – to host open houses and events that were attended by more than 35,000 people. 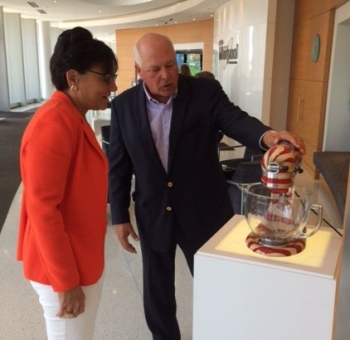 Secretary Pritzker went on to discuss how the Department of Commerce fosters innovation everyday – from the U.S. Patent & Trademark Office, which assists inventors and helps them protect their intellectual property rights, to the National Oceanic and Atmospheric Administration (NOAA), which produces close to 20 terabytes of data each day that helps businesses make more informed decisions. On the panel, Secretary Pritzker was joined by Jeff Fettig, Chief Executive Officer of Whirlpool; Bill Weideman, Executive Vice President and Chief Financial Officer of Dow Chemical; Kurt Darrow, Chief Executive Officer and President of La-Z-Boy; Kevin Lobo, Chief Executive Officer and President of Stryker; Bill Parfet, Chairman and Chief Executive Officer of MPI Research; Fred Bauer, Chairman and Chief Executive Officer of Gentex, and Jim Keane, Chief Executive Officer of Steelcase.